The safety of our constituents is a primary concern for us here at UF CARD. Below are many resources to assist in keeping individuals with ASD safe. These resources address issues related to water and fire safety, wandering, and interacting with law enforcement. Please click on the links below for additional information. UF CARD constituents can call us at 352-273-0581 to request an Autism Safety Gear box. Project Leo is a pilot project to provide personal devices to aid search & rescue efforts for persons with Autism Spectrum Disorder in Alachua, Baker, Columbia, Hamilton, and Suwannee Counties. Smart911 allow you to add key information about members of your household that would help anyone you care for in the event of an emergency. This information is available to operators whether you contact 911 from your home phone or any mobile phone. This card helps identify individuals with autism spectrum disorder, should they need to disclose their disability to law enforcement or first responders. Directions on how to use the card are described in the link above. Written by Kari Dunn Buron, A 5 Is Against the Law! Provides strategies for addressing challenging behaviors that can lead to trouble for adolescents and young adults who have difficulty with social boundaries. Teaches young adults with autism spectrum disorders how to safely interact with law enforcement. Helps Putnam County’s most vulnerable citizens obtain wearable tracking devices. If your loved one is in danger of wandering/elopement due to dementia, autism, or intellectual disability, please call them at (386) 329-0538 for more information or visitwww.putnamprojectlighthouse.org. Scent Saver kits preserve the scent of a loved one prone to wandering and can assist K9 search efforts in the event of an emergency. Check with your local sheriff’s office to see if they have a program. Here is a news story about the program in Marion County: https://www.wuft.org/news/2017/06/19/marion-county-sheriffs-office-hands-out-scent-preservation-kits. 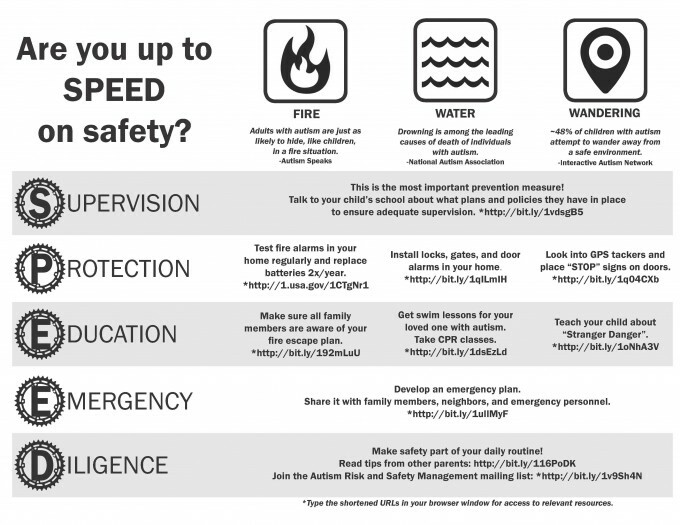 Download our Autism and Safety Awareness flier by clicking on either image below….